When I recently read about a new string of murders in the Mexican border city of Juarez and then saw an article about how new murders break the 2008 record in Mexico, I couldn’t help but think about all the bad press our neighbors to the south have been getting lately. Between failed plane high-jackings, drug wars in the border towns and Swine Flu, Mexico has certainly had it’s fair share of negative news this year. In an already suffering travel year, it’s not hard to imagine that all this negative press paired with the traditional shoulder and low season has made for some pretty incredible deals on Mexican vacations. See moreWeekly Hot Deals to Cancun/Riviera Maya! Flight + 3 nts at Mexico Resort starting from just $299. Limited Time Offer. If the scary news coming out of Mexico has scared you away from taking a vacation there, there are a few things you should keep in mind. First off, most the violence has occurred in the border towns (far from the tourist destinations) and involve warring drug cartels (not tourists). You are also just about as likely to get the Swine Flu here in the U.S. or Australia as in Mexicomeaning you’d be foolish to let these concerns prevent you from taking advantage of some of the screaming good deals in Mexico right now. In fact, according to ABC News, Mexico is still on Agents’ Top 10 Travel list despite the Swine Flu and other concerns. Cancun came in as No. 2 on the list, Riviera Maya as No. 3, cruises to Mexico were No. 7 and Playa del Carmen was No. 10. If you are headed to the Number 2 destination of Cancun, you’ll be happy to know that now is a great time to get screaming good deals on everything from cheap airfare to Cancun to cut-rates at hotels in Cancun. Sometimes the best way to save the most amount of money is also to snag up one of the many fantastic deals on all-inclusive vacations in the country (meaning you won’t even have to get your wallet out once you are there). Jen Leo from the Los Angeles Times reports that Club Med in Cancun is offering up a pretty sweet deal on what they call a 7-day weekend. Prices on the package starts at $799 per person (kids are 50% off) and basically gives you 6-nights at their all-inclusive resort for the price of three. For the best prices, try traveling in September and October. 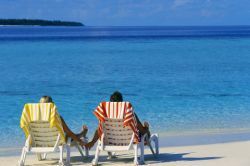 Dealbase.com is also offering up a “Fun in the Sun” package from the Hilton Cancun Golf & Spa Resort, which includes a fourth consecutive night free and a $100 resort credit on nightly rates from $74.25.